Getting a good sleep is very difficult for a lot of us. Some of us have trouble getting to sleep, while others have more trouble staying asleep. Did you know that one of the worst culprits, according to the National Sleep Institute, is having pets! I think the stress relief they provide me in the daytime offset the problems they cause at night, but I can attest to the fact that the night time cuddle sessions do interrupt my sleep! I shudder when people tell me they are on a no-carb diet. I have recently created a meal-plan and recommend adding "Starchy Carbs" and/or "Simple Carbs" to every meal! When it comes to carbohydrates, just like fats, there are good ones and bad ones. Beans and Lentils, part of the "legume" family, just may be my #1 choice for a healthy carb. 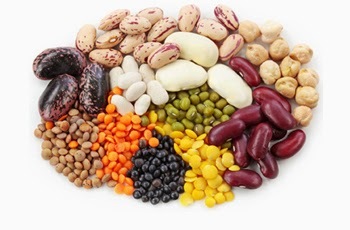 Packed with loads of fiber and protein, these guys come in so many different varieties that you'll never get bored: lentils, chickpeas, black eyed peas, black beans, red beans, kidney beans, navy beans, butter beans, lima beans, pinto beans...and the list goes on. Because of their fiber & protein content, along with their versatility, I eat something from the legume family in at least one of my meals daily. I'd highly recommend you'd do the same! While brown rice is thought to be the healthy grain, there’s one even better, and that’s quinoa. Quinoa is a gluten free grain that contains double the protein of brown rice along with greater fiber content and a lower glycemic load. Not only that, but quinoa is the ONLY grain to contain complete protein and the full spectrum of amino acids. It comes in several varieties, including “oatmeal-like” flakes and it’s wholegrain rice-like form. Enjoy it as an oatmeal substitute for breakfast, in salads or casseroles, or as a wholesome whole-grain, high protein side item to any lunch or dinner meal. Sprouted grain breads, like Ezekiel 4:9 bread (one of the most popular brands of sprouted grain bread) is a great way to include bread in your diet on occasion without all the issues associated with white breads and even 100% whole wheat breads. Instead, Ezekiel bread is organic, sprouted, 100% whole grain flourless bread. A 2-slice serving even contains 8 grams of complete protein and 6 grams of fiber, so don't give up the bread, just choose the right kind! Berries like blueberries, blackberries, raspberries and cherries (although not technically a berry) are some of the BEST carbs you can eat. They are high in fiber, packed with antioxidants, and score extremely low on the glycemic index, especially cherries which come with a GI of just 22.